Eggplant didn’t appeal to me at all in my youth. Back in Iowa, we shared a large garden at my Uncle Lou and Aunt Esther’s house a few blocks away. Beside the usual tomato and cucumber plants, we grew eggplant. Something about the texture of cooked eggplant grossed me out when I was young. And then…I fell in love. I am now at a stage where I adore most everything where eggplant is a star: Eggplant Tomato Gratin, Eggplant in Moussaka, Eggplant with pasta…but today I wanted to share my most basic recipe for eggplant — the one that I make more than anything else. I’m guessing at least every other week I buy a couple of large eggplants, cube them, salt them, rinse and drain them and then saute them plain or add tomato sauce or cherry tomatoes or lots of garlic. My method requires very little oil to soften the vegetable and it comes out tasty, not bitter and not oily. 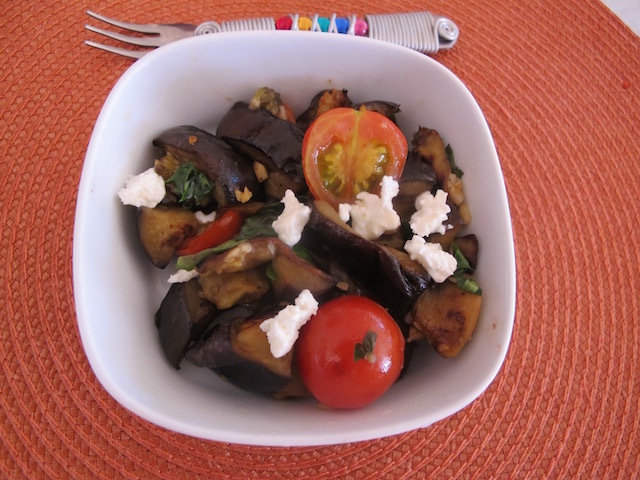 If your relationship with eggplant is lukewarm, try this and let me know if you change your mind!! 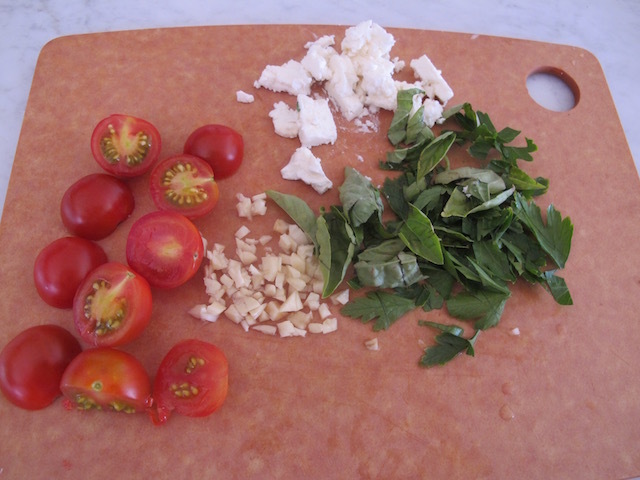 Summer is an especially great time to make this if you grow fresh parsley or basil or cherry tomatoes. Slice off both ends of each eggplant. Cube eggplants into 1 ½ inch pieces and put them in a large strainer. Toss well with salt, and leave the strainer in the sink. Walk away and leave the eggplant alone for at least 1-2 hours or even longer, stirring it every half hour or so. I often do this in the morning hours, go about my business and come back at lunchtime to continue! Using cold water, rinse the eggplant cubes and rub them gently in your hands. A lot of the seeds will wash away. Shake the strainer well to remove water too. On the countertop, put out three layers of paper towels and place the well drained cubes single thickness. Cover with another three layers of paper towels. Press each cube gently to remove even more moisture. Keep doing this with fresh paper towels until the moisture is mostly out and the eggplant feels softer. You can cover and refrigerate the eggplant cubes overnight at this stage if you like. When ready to cook, use a large saute pan. Heat the olive oil on medium high, and add eggplant cubes, browning them for about three minutes. Lower heat to medium-low and continue cooking and stirring every five minutes until the eggplant is brown and tender, about 15 to 20 minutes. Add black pepper and minced garlic and continue cooking another two minutes. Remove the pan from the stovetop and add in herbs, adjust seasonings, and serve. There are many variations here: you can add halved cherry tomatoes along with the garlic, top with crumbled feta cheese, or coat the eggplant cubes with homemade tomato sauce and a grating of imported parmesan. The sky is the limit! This entry was posted in Vegetables and tagged Eggplant. Bookmark the permalink.